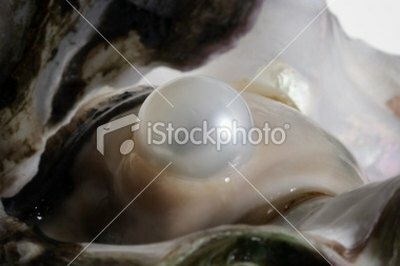 Though it is a nice thought, pearls unfortunately are not oyster babies. They are actually oyster irritants. Natural pearls, sometimes called Oriental pearls, are created in the stomach of the oyster when an "irritant," usually sand or a very small particle of rock, manages its way into the shell of the mollusk. To protect itself from the intruder, the oyster produces a liquid known as nacre (nacre is the same material that the oyster uses to build its shell). Nacre is secreted over and over in layers enveloping the irritant to make it smoother. Eventually over time, the layers--in a snowball effect--create a large, shiny pearl of various colors (white, pink, black, red, blue and green). Pearls usually take an average of 3 years to reach their full size. For this it is apparent why a pearl necklace costs what it does. A cultured pearl is formed inside the oyster the exact same way a natural pearl is. However, a cultured pearl is obtained only at the intervention of humans. Oyster farmers surgically insert an irritant--usually a small bead or piece of oyster shell--into the oyster. Usually, the pearls formed by shell irritants (rather than sand) have a center made up of finely ground oyster shells; these are known as Mother of Pearl. Thus, the cultured pearl produced is much larger than a natural pearl, as the core (irritant) is much larger to begin with. The oyster responds to the inserted irritant with the same defense mechanism used against the natural sand irritant. Though cultured pearls can be identical in luster and beauty, natural pearls are often more expensive and considered at a higher degree of value because they are rarer. Imitation pearls have absolutely nothing to do with oysters, as they are imitation. They are usually made out of small glass beads dipped in a paint made from fish scales (for the iridescent shine). Imitation pearls are therefore quite inexpensive compared to real pearls. Therefore, be aware when purchasing pearls. The "test" to check for authenticity is in the bite--imitation pearls will slide nicely across your teeth; real pearls will feel gritty. Both natural and cultured pearls can be "harvested" in either fresh or saltwater. Saltwater pearls are often held at a higher quality, as most freshwater pearls are slightly lumpy in shape. The majority of the world's pearls come from Japan, Australia, Indonesia, Myanmar, China, India, Philippines and Tahiti.